We all know just how important it is to make your newsletter personal to each subscriber. It’s 2016, after all. But is personalisation something you’ve actually managed to pull off? Personalised newsletters do not need to be the white whale of ecommerce marketing; they are something that should be considered achievable, straight-forward and - in an ideal world - already part of your email marketing strategy. But if your brand hasn’t yet taken the steps needed to reach the perfect, personalised newsletter template, that’s fine. This blog post has been written to help ecommerce marketers like you either get started, or improve on what you’ve managed to do so far. From product recommendations to contextual content, here are four ways you can make your brand’s newsletters more personal (and your day that much easier). One obvious way to make your newsletters more personal is to maximise all of the information you already have on your subscribers. It is quite easy to use factual information such as this in your newsletters to give a personal touch. This can be achieved via dynamic content (content that changes according to each individual customer or group of customers). With all of this personal and behavioural data collated and stored into a single record for each contact, you will have created what we call a single customer view. Once you have built a profile for each customer, including their personal preferences and tastes based on their browsing and buying behaviour, you can accurately predict which content is most likely to catch their eye. (This is what we call taste profiling). You can then start to use this information in your newsletter, again via dynamic content. a) First name personalisation in the subject line and body of the email. b) A dynamic content block that alerts subscribers who are students about the upcoming student sale (without annoying subscribers who aren't students). c) A dynamic content block within your newsletter for VIP customers letting them know about a special event or exclusive promo. 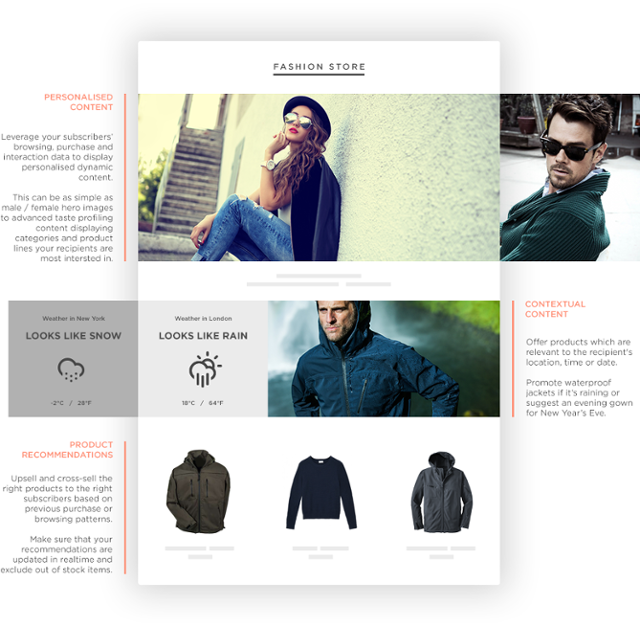 d) A dynamic content block that is tailored to each customer's unique taste profile (focusing on, for example, t-shirts or trainers). Dynamic content doesn’t have to be based on personal information about your subscribers; it can also be based on external factors. One external factor your newsletters’ dynamic content blocks could hinge on is weather. This would mean that, instead of each email having a big image displaying items either targeted at men or women, they would be personalised for sunny days or cold days. This enables a subscriber in, say, Sydney to receive a newsletter tomorrow with a wintery banner, but a subscriber in Rome a summery one. Other examples of contextual content could be time based: including a live countdown to a specific date, such as Christmas Day or New Year’s Eve. What exactly are product recommendations? Seems like an easy question, but it’s worth clarifying. Product recommendations are a selection of products that have been automatically selected by a specific algorithm. So, what are the different types of algorithms you can use to filter your product recommendations? To make your brand’s product recommendations even more tailored, you can add extra filters to each of your algorithms; for example, product categories and price. It’s important to ensure stock is taken into account here, as you don’t want to recommend items that aren’t even available! When dealing with product recommendations, bear in mind segmentation. For instance, if you're a childrenswear brand and want to send a newsletter focused on boys’ shoes, you won’t want girls dresses in there - even if they are best sellers. To get around this, you can restrict your dynamic product recommendations to focus on your overall message. So, in this case, said childrenswear brand would want to restrict the recommendations to the boys’ shoes category only. Now, prepare yourselves, this is next level personalisation. As the name suggests, open-time personalisation refers to newsletters that only get personalised once a recipient actually opens an email. This means that, if you were to send out a newsletter with a header image advertising your current clothing line, if a recipient opens it a few weeks later and a new line has been released it doesn’t matter - the latest line will stay show up. I know, pretty good. The only caveat to this type of personalisation is that, at present, it only works for images; text, unfortunately, cannot be optimised in open-time. Consequently, if you do implement open-time personalisation in your newsletters, don’t accidentally use an image that is open-time but text that is static. That could lead to some seriously cringe results. We suppose the way to get around this is to use generic copy or use an image that shows text. While typical marketing platforms let you A/B test whole messages, they are not built to be able to evaluate the performance of each of the various dynamic blocks, or personalised elements, within them. Marketers may therefore struggle to determine which of the above tactics are actually increasing performance, and how you can improve on them. However, ultimately, if you take heed of this blog post, your newsletters will be on a one-way ticket to awesome personalisation. These are just a few examples of what can be done and, as we continue to develop our product, a plethora of new ways to personalise are being thought of every day. Here at Ometria, we combine in-depth customer insight with a retail-specific marketing automation platform to enable people like you to send customers personalised marketing messages. Find out more by clicking here. You can also learn more about how to successfully personalise the customer journey at our annual Lifecycle Conference on 12th October. To find out more and register, click here.